BC Liberals Advertising for the Greens in Victoria! 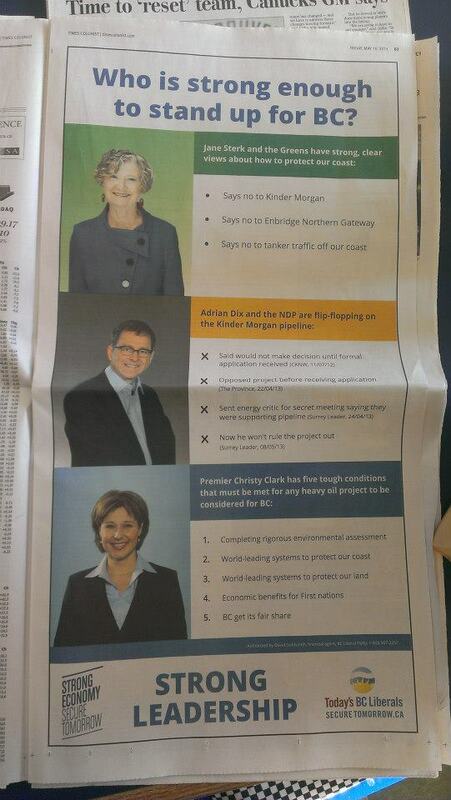 I was tooling around on Facebook this morning, and some of my Green Party of BC FaceBook friends were talking about this full-page advertisement for Jane Sterk and the BC Greens in the Times Colony. You know, one of the most read newspapers on Vancouver Island. The thing is, this advertisement is bought and paid for by the BC Liberals. What I know about Provincial politics in BC could fit into a medium-sized tea-cup. I do know that it is a hypercompetitive, take no prisoners environment, and this ad highlights that fact. The purpose of the ad is obvious. The Liberal Party believes that the NDP and Greens are feeding from the same plate. There are two tactical outcomes this ad is promoting. The most favourable would be that the NDP and Green split is even enough that the Liberals can achieve a plurality in some, or all of the Island ridings. The second, deeper game is that the Greens should tip the balance and elect Andrew Weaver MPP for Oak Bay. This secondary objective denies the seat to the NDP, and establishes a Green presence in the Legislature. The benefit of that first outcome is obvious. Every dipper who votes Green is one vote closer to the coveted Governing Mandate for the BC Liberals. The second outcome is useful in a tactical sense, (Like helping decide whether the Liberals or the NDP have more seats on E-Day). Strategically, there is probably some more subtle thinking at play. If there is not, there surely ought to be! The most likely winning Green candidate, Andrew Weaver (Oak Bay – Gordon Head) is a heavy hitter. His election to the BC Assembly will represent a coming of age for the BC Greens. There is no doubt that adding Provincial representation to the Federal presence of Elizabeth May will be a big boon to building up a considerably stronger regional Green stronghold in BC. There will be another constituency office, staffed to the max, generating plenty of column inches in earned media over the coming years. The BC Greens definitely eat from the same plate as the NDP. If the BC Greens do in fact elect Weaver, then the Greens are going to consolidate that win, gain credibility, and build for the next election from a much stronger base. The BC Liberals will be a major beneficiary of a stronger BC Green Party, as the bulk of the growth in Green support will come at the expense of the NDP. Put it all together, and an enhanced BC Green Party will in the long run be a huge boon to the BC Liberals. The implications for the Federal Liberals in BC are a little more ambiguous. You see, they have serious prospects of eating from the same plate as the Greens and Dippers come 2015, so strengthening the Green brand in BC will cost them only a little less than it costs the Dippers, but that federal analysis will have to wait for a more opportune time. Anyway, I think that most of what I said here today is pretty obvious and un-remarkable. What was remarkable to me is this big media buy by one Party on behalf of another Party in a General Election. I think it is unprecedented, can anybody else think of similar examples? I would be interested in knowing, as a student of the dark arts of Canadian electoral politics, lol. Hey, Matt. The Greens aren’t running a candidate in my “too close to call” riding. I assume it’s because the NDP has a chance of finally stealing the riding from the Lib/SoCreds. That assumption has been reinforced by the appearance of Green candidates from other ridings showing up here in support of the Dipper. I think you’ve probably hit on it, Matt. The sitting government has given centrists plenty of reasons to defect and, for us, the Green Party has been a natural place to “park” our votes. I certainly arrived there, federally and provincially, with that intent. In short order I came to realize that was where I belong at least until the LPC embraces Green policy. However, given the importance of this supertanker issue, Harper’s other outrages against our coastal ecology and our deserved distrust of the provincial Liberals to stop it, we are driven into the arms of the NDP in this election. Greens a false front organizations being funded by the Liberals provincially and the Conservatives federally to split the NDP vote and allow Libs and Cons to take key districts. Comox Valley BC Liberals even urged their members to donate to the Greens prior to the latest provincial campaign! Green voters duped and sucked in by Sterk and her emerald impostors. And the rest of the voters will eventually get to watch oil spills on the North Coast. Not too surprising that with all that money, the Corporate parties can buy another party for their advantage. Democracy is a joke for the psychopaths in the boardrooms. As one well-connected Comox Valley BC Green Party member told me the other day, their long term goal is to take over the NDP. By running candidates in strategic districts and splitting the vote, they can ensure the BC Liberals (and to a lesser extent, the Conservatives federally) form government. Liberal policies, of course, hasten environmental degradation. The resulting media focus can be exploited by the Greens to improve their electoral outcomes. In short, help to create the crisis then act as saviours. Politics is a dirty business indeed.